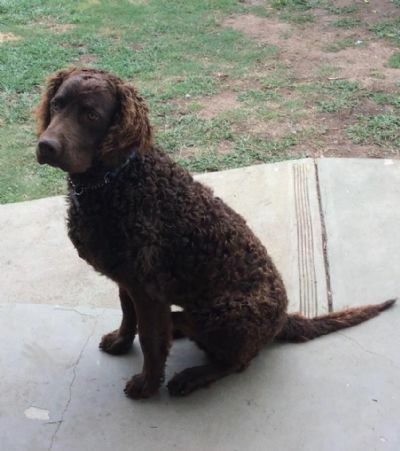 The Curly Coated Retriever Association of Victoria (CCRAV) is the only club with the responsibility of representing the Curly Coated Retriever breed in Victoria. We are one of two clubs within Australia who represent our breed, the other being the Curly Coated Retriever Association of NSW. Our membership base includes many varied disciplines, be it a beloved family companion, obedience, showing, retrieving, tracking or hunting, we all enjoy getting together and sharing a tale or two about our curly friends. The CCRAV holds social events, including education for owners on areas of interest. Is a Curly Coated Retriever the Dog for You? The Curly Coated Retriever is a strong upstanding dog with a degree of elegance and a distinctive coat of crisp tight curls. He is the largest of the retriever breeds and also one of the oldest. Males stand at 69 cms to the withers and females 64 cms. The coat is black or liver with the most common colour being black. A commonly asked question is “do they shed”. Yes they do! An intelligent, loyal, steady and reliable dog he is proud, friendly, self-confident and independent and may also seem aloof. He is well suited to most activities, field, obedience, showing and especially as a trusted family companion. He is a recognised breed with the Australian National Kennel Club (ANKC). You should also ask for copies of relevant health tests conducted on the puppy’s parent e.g. PRA, EIC and Hip Scores (more information on this site’s health page). Breeders listed on this site are can assist with more information about this wonderful and uncommon breed or contact our Secretary Melinda Naughton on 0401 138 905 or email [email protected]. 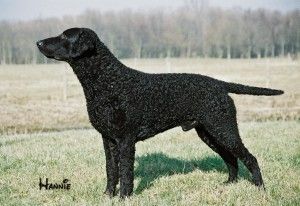 There is another dog referred to and sometimes sold as a “Curly Coated Retriever” or “Murray River Curly Coated Retriever”. This dog is quite different in looks and temperament and their DNA does not link them to the registered Curly Coated Retriever. The “Murray” is a smaller dog (46 to 53 cms) with a generally looser coat, large ears and only comes in liver. This dog is currently not a recognised breed with ANKC. The CCRAV 2020 Calendar is now in production - calling for pictures! This years theme is: "CURLY FAMILIES"! We are hoping to feature groups of cur;ies - puppies, family groups, all ages and sizes! Please submit all images in original format by emailing [email protected]. Alpha Dog Beds has made the decision to donate 50% of all profits to pet rescue and welfare groups . Because of this, they've changed the business name to Paws For A Cause, to better reflect their mission and vision. They still make great dog coats (& dog beds), but now it’s for a great cause! Visit the website for more information (https://pawsforacause.com.au). NEW we now have a Puppy Inquiry Officer (Alexis Colgan). For all inquiries regarding welcoming a CCR into your home and hearts please email Alexis on [email protected] or contact her via phone 0402 750 636.